This peak is unnamed on OS maps. It lies on the boundary of the townlands of Bellanaboy and Meenamaddo. Any information on the correct name of this hill would be welcome. Has been called Meenagleragh. Meenamaddo is the 1093th highest place in Ireland. Move along folks, there's nothing to see here. 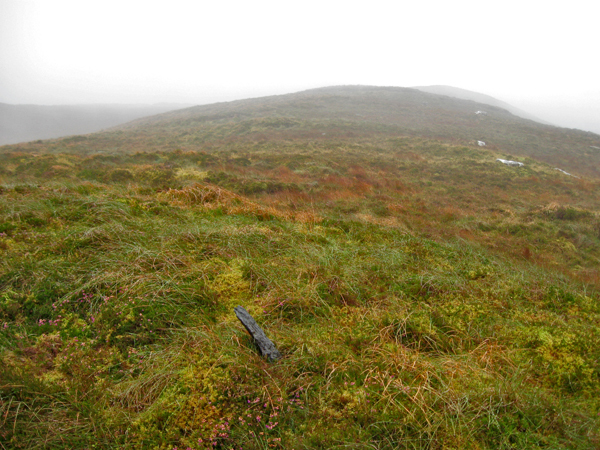 When you do a walk in a grey mire, there's very little to report in terms of describing the views or relevant features of the locale. I did something similar to Sandman, starting at the car park NE of Lough Easky, and headed anti-clockwise around the lake.